After hibernating and playing couch potato all winter, doesn’t a fitness-fueled getaway in a beautiful natural setting sound appealing? 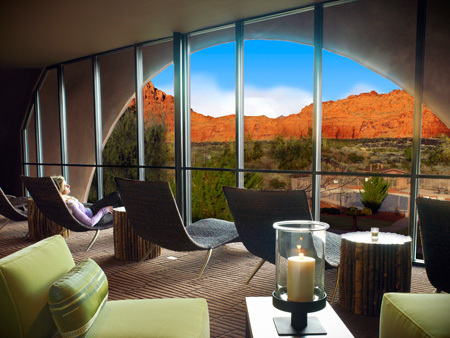 SheKnows visited Red Mountain Resort to experience a fitness retreat firsthand. Here’s what we found. 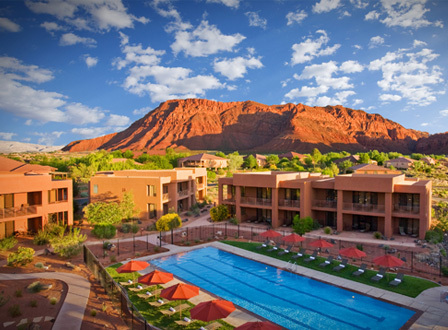 Distinguished by well-manicured lawns and gardens, inviting hammocks and buildings uniformly painted an earthy terra cotta color to blend with its picturesque backdrop, Red Mountain is a sprawling resort in St. George, Utah. From cardio-revving workouts like Bootyque 47 to toning classes like Chiball stretch, the resort offers a daily variety of fitness classes in addition to complimentary bikes for roaming, luxury spa services and wellness workshops. Life coaching, cooking and other holistic health classes are also available. 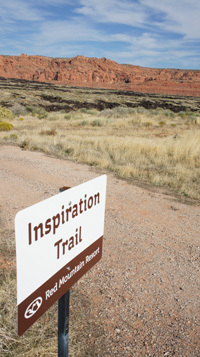 We started our fitness getaway with a brisk two-and-a-half-hour morning hike through the rugged red mountain terrain of southwestern Utah. As we climbed – accompanied by a group of friendly resort guests from across the United States — we inhaled the unpolluted air and marveled at the stunning natural landscape. When prompted by our guide, we paused to snap photos of the ancient petroglyphs carved in the rocks by the Native Americans who once roamed this majestic terrain. Unlike similar resorts, where a weeklong commitment is often mandatory, guests are invited for any length of stay and there’s no set arrival and departure time. Exercise buffs who want a more structured program, however, can register for Red Mountain’s seven-night Fitness Intensive Retreat (rates start at $295 per night), which is geared for guests who want to be active for 6 to 8 hours a day and includes specialty fitness classes and activities, a heart-rate workshop, a personal training session and a metabolic profile assessment and resting energy expenditure (REE) analysis that give feedback on how to work out smarter, not necessarily harder. “We give them an itinerary and plan their day,” says Red Mountain’s director of fitness Kim Watters. The retreat starts with a guided hike each morning followed by stretch, yoga or Pilates. During the Fitness Intensive Retreat, guests are encouraged by a team of professionals and often bond and motivate each other. After a rigorous workout, guests can unwind in one of the resort’s 24 two-bedroom luxury villas, or in one of the 82 deluxe rooms that were redesigned with new furniture, enlarged bathrooms with deep soaking tubs, granite countertops, slate floors and hypoallergenic bedding. All rooms come with cable TV and free Wi Fi, and pets are welcome in some deluxe rooms. Rates range from $229 to $709 per person per night and include all meals and daily program activities. With three healthy-but-hearty meals per day, you won’t feel deprived during your stay at Red Mountain. 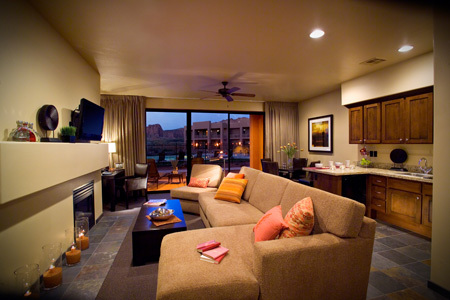 In fact, the meals are so frequent that we spent nearly as much time at the picturesque Southwestern-motif Canyon Breeze Restaurant as we did in our apartment-size villa suite. Breakfast and lunch are served buffet-style and dinner is a la carte. From Tex-Mex to Boca burgers and baked fries, we enjoyed the variety offered at lunchtime — especially the sweet treat of a peanut butter or chocolate chip cookie to snack on after Zumba class or an afternoon power walk. All dinner entrees are less than 550 calories, but executive chef Dale Van Sky packs them with plenty of flavor. A snapshot of the dinner menu includes scallops and pasta with crimini mushrooms, diced tomatoes, poblano pepper and shallots (341 calories) and a vegetarian option of quinoa, vegetables and feta cheese with asparagus, bell peppers, leeks and garbanzo beans (276 calories). Kosher, vegan and gluten-free meals are also available on request. Dessert offerings like deconstructed blueberry cheesecake with graham cracker crust (266 calories) and peach upside down cake topped with brown sugar, cinnamon and nutmeg (192 calories) will satisfy your sweet tooth without expanding your waistline. 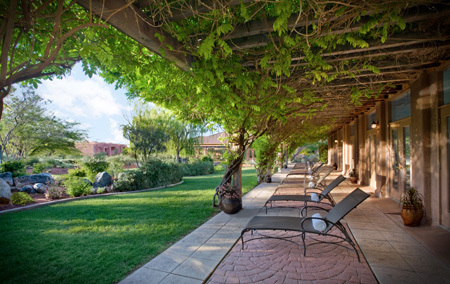 A fitness retreat at Red Mountain isn’t complete without taking time to soothe your sore muscles at the serene Sagestone Spa & Salon, where we unwound during a tension-taming Sagestone customized massage ($150 for 80 minutes). The spa – housed in a unique dome structure awash in hues of chocolate, lime and moss green – offers more than 50 anti-aging, detoxifying and healing services, 14 treatment rooms and separate men’s and women’s locker rooms with steam rooms. A large half-moon-shaped window with awe-inspiring views transforms the waiting area into a space for meditation and reflection. “We know that stress reduction is an important part of overall fitness, and hope this concept is [reinforced] to each guest,” explains Watters, who adds that most forms of exercise reduce stress by stimulating the brain’s feel-good neurotransmitters also known as endorphins.